06:00 - zzzzz.... Time we were supposed to be leaving. All three of us were fast asleep as we did some grocery and supply shopping until midnight the previous day. Lesson #1 - Shop early. Never leave anything for the night before. 07:00 - Half awake at last! But Jordan (our four year-old son) wanted "Whale" and "Walrus" cut-outs. So google image search, print-outs, cutting and pasting! 08:00 - Ticked off Suzie's (my wife) camping list. Found some items missing and got those sorted out. As this was our first camping trip, we went with "more is safer" and took quite a few extra things. Lesson #2 - Keep a check-list and tick-it off. It helped us. 09:00 - Breakfast @ home. Suzie was keen to have Jordan do the "BIG" job before we left. So bananas and fruits did the trick. Jordan was ready to go... All of us were actually! 10:00 - Started loading the SUV. Two folding foam mattresses and the luggage area was full. 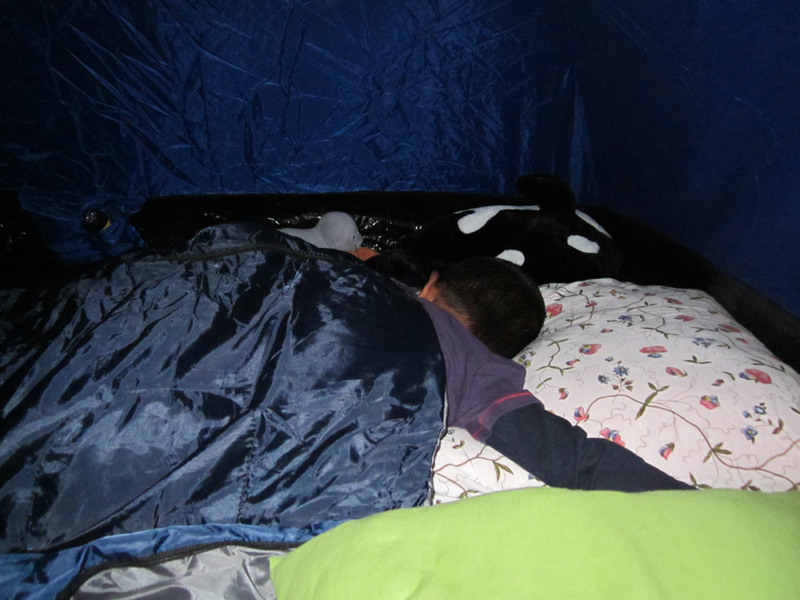 Took those out and decided to purchase three sleeping bags in 'camping' style ;). 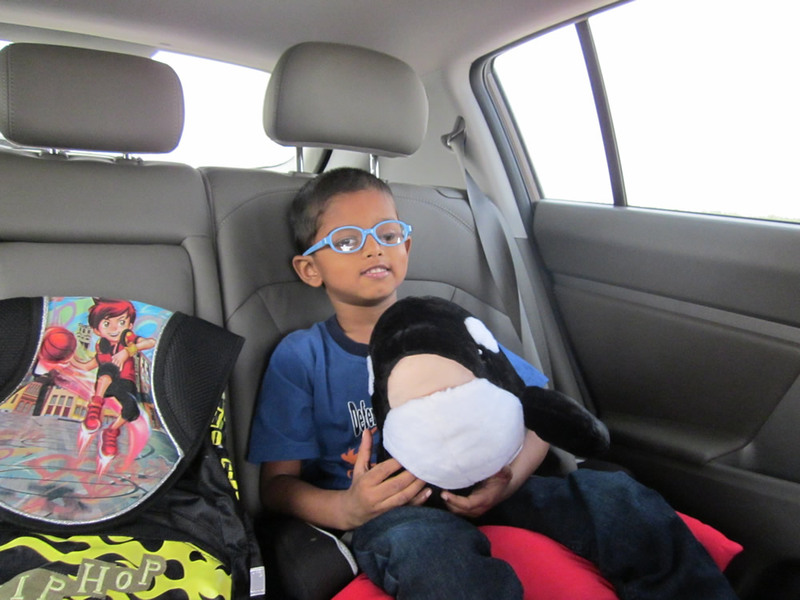 Loaded up our loot and we were on our way with a pit-stop at Carrefour Sharjah. 11:00 - Purchased the sleeping bags, Mineral water for drinking and a Whale for Jordan. 11:30 - Left Carrefour and we were actually on our way! 5½ hours late, but the happy campers were on their way. 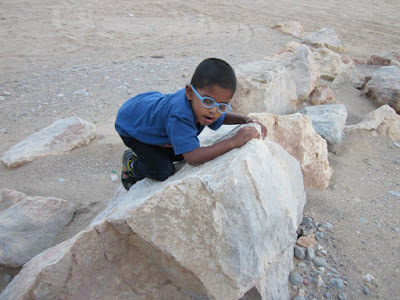 In Jordan's words - "The Adventure begins"
Lesson #3 - We were glad that we were doing this trip on our own. If we had friends going along, this delay would have got a few nerves popping. Keep to time or go on your own if you are a habitual late-comer. 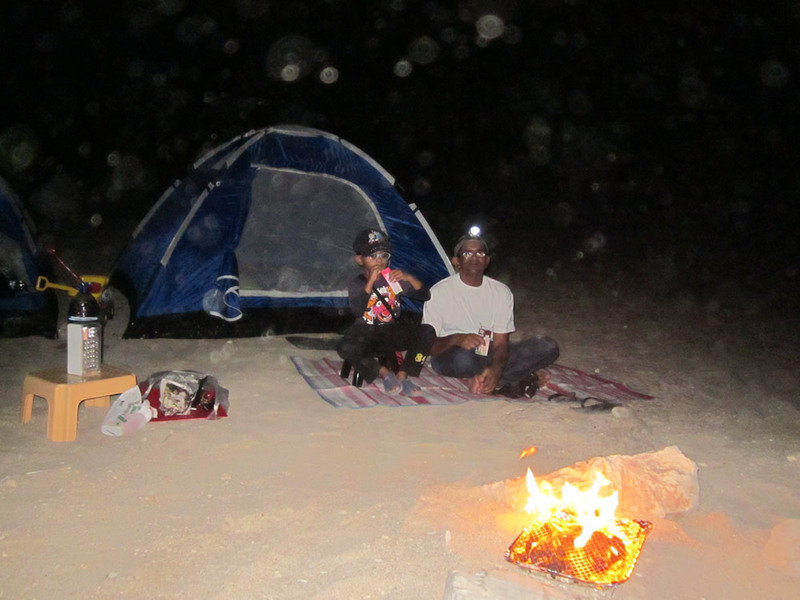 This was our first camping trip and hopefully, the next one would be better organized and timely. 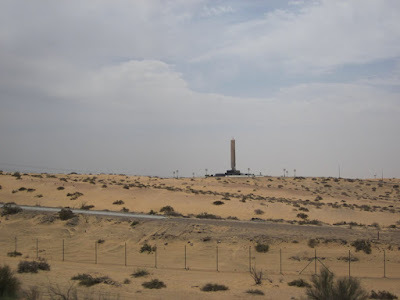 Our planned adventure (Thanks to the UAE OFF-ROAD book from Melvin) was to take the E11 from Home and then take the E88 ("Al Dhaid Road") past Sharjah Airport and the Cement Factory. 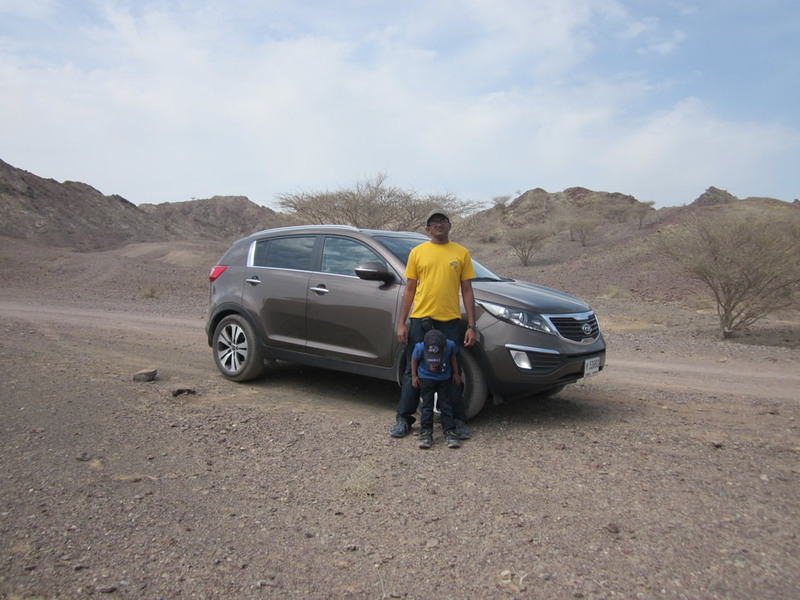 After Al Dhaid, we were to go along the E88 and take the turn-off to Ras Al Khaimah (RAK). 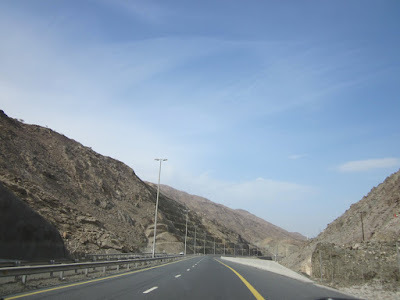 Along the route to RAK on E18, turn off at Al Ghail and go through Wadi Al Fara and Wadi Al Sidr/Sana to connect to E89. 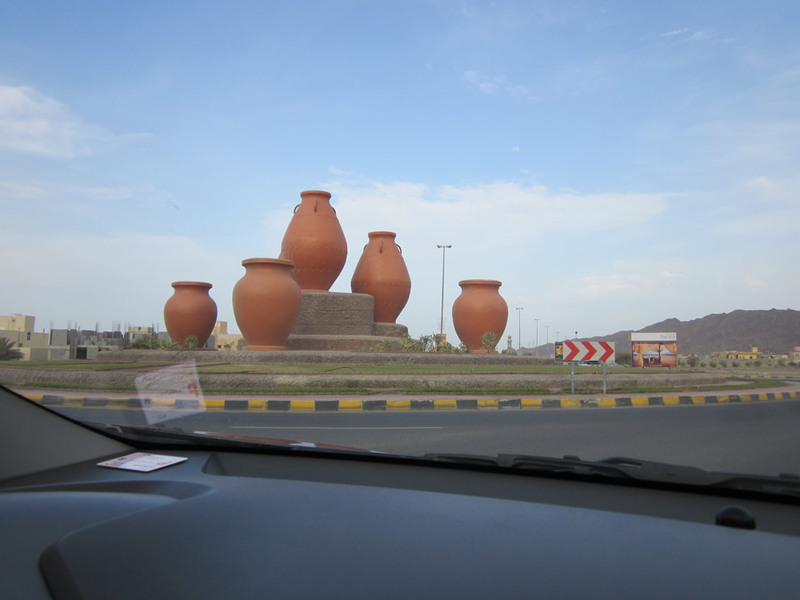 Go Along E89 to Dibba, Fujairah and then on to our camping ground next to the Golden Tulip Hotel in Dibba, Oman. Path marked in purple our the roads used on both days, orange paths used only on Day 1 and green paths used on Day 2. 12:00 - On our way out of Sharjah. A little past the Airport, and the speed limit is 120 KMPH. Cruise Control and here we go. Stopped in Al Dhaid to purchase some lunch. Many of the shops were closed. One restaurant called "Chicken ??? ", had some very questionable smelling oil and we settled on a Mandi Biriyani take-away from another restaurant. 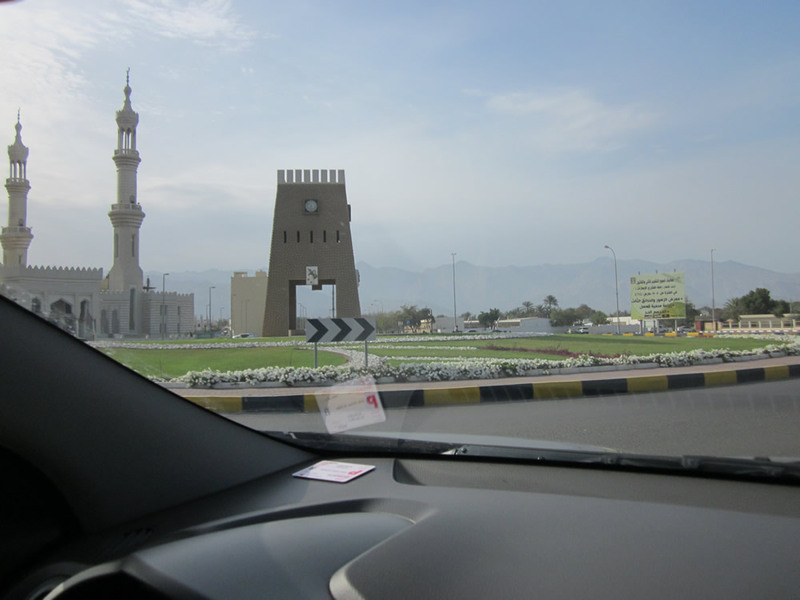 13:00 - Missed the turn-off to RAK and had to come back a few kilometres. Turned on Nokia Maps and that helped us find our way along E18 to Al Ghail Secondary School. 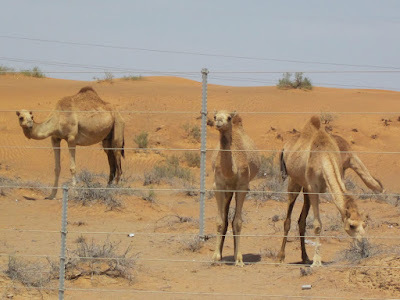 On the middle of E18 we came across a herd of grazing camels. 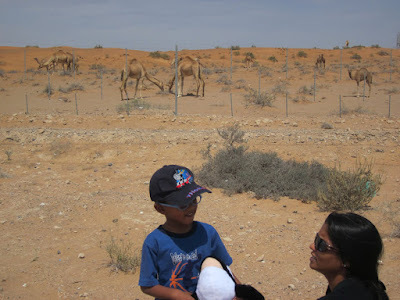 Jordan counted 22 and was so happy to be able to start off his adventure seeing camels. 14:00 - Arrived at Al Ghail Village and went past the tarred track to begin our wadi journey. Had our lunch on the side of the gravel path. Jordan climbed Pontypandy mountain (from Fireman Sam) and collected rocks for his collection. Noun: (in certain Arabic-speaking countries) A valley, ravine, or channel that is dry except in the rainy season. 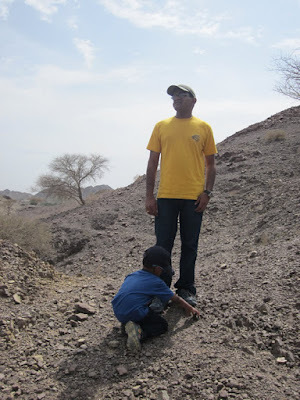 15:00 - After lunch, we wondered around (a little lost) finding the correct path to Wadi Al Fara. Unfortunately, we ended up at two dead-ends and decided to call it off. 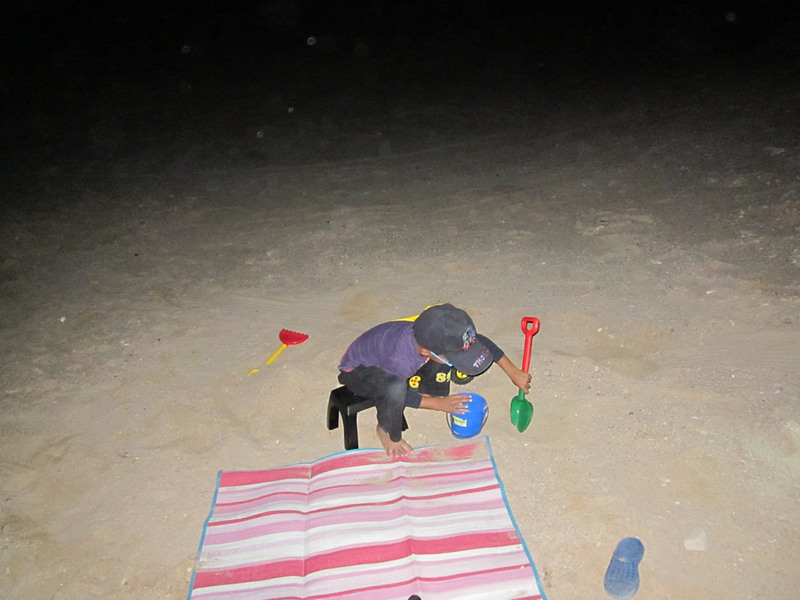 We did not want to get too late to set-up camp and Jordan was impatient to get to the beach. 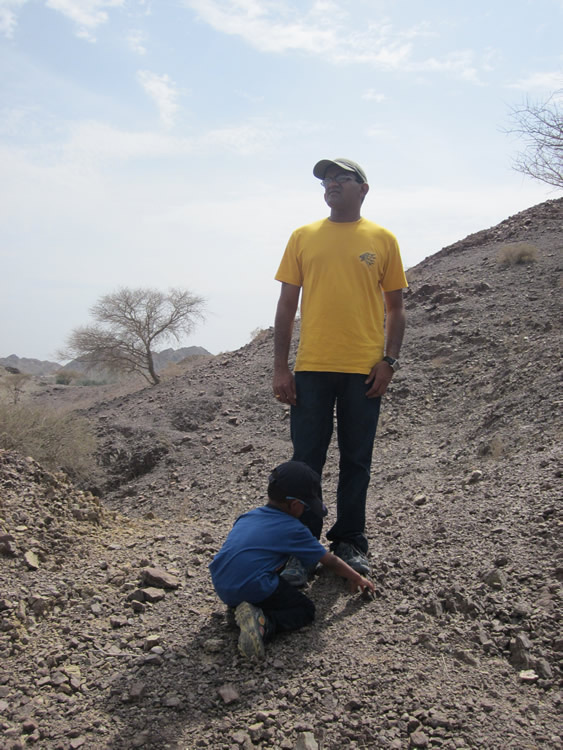 So we retraced our steps back to E18 and continued along E87 to Dibba. Lesson #4 - If you are exploring unmarked roads, make sure to take some friends in another 4 Wheeler to help you out in any tight spots or to keep you company when you get lost. Lesson #5 - Be very careful when you reverse (especially of rocks jutting out of the ground). I had a bad experience of a rock jutting out of the ground hitting the chassis of the Sportage. Luckily no lasting damage. Lesson #6 - Have a smart phone with GPS Navigation. We were lucky that Nokia Maps were quite current. The Garmin Maps installed on my phone were not updated, and most of the newer roads were not available. 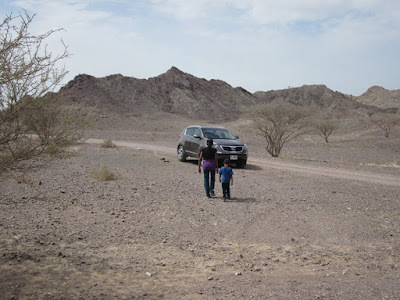 The UAE OFF-ROAD book was the best updated of all this, but the navigator made finding directions a snap. 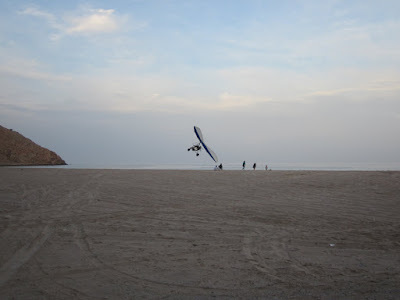 16:00 - We reached Dibba town. 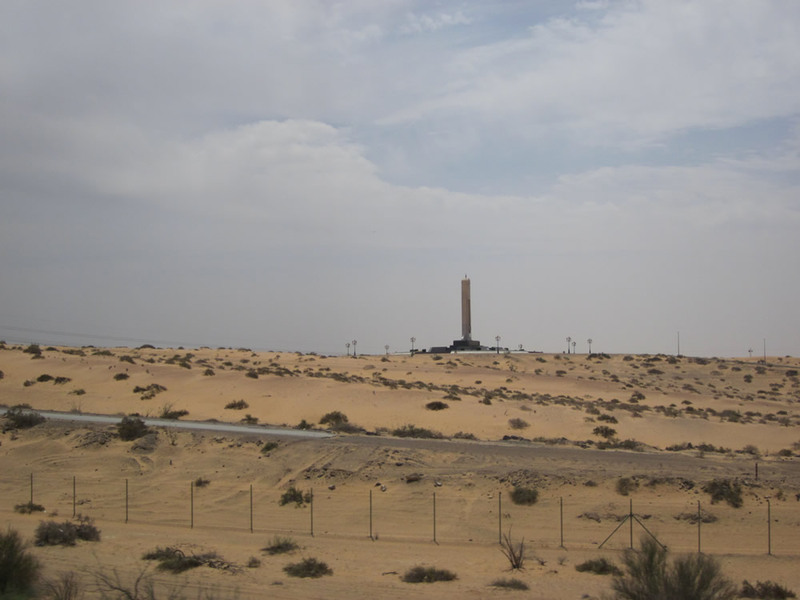 Stopped at a well-stocked Lulu Hypermarket on the way and purchased food for the BBQ and a camping stove. 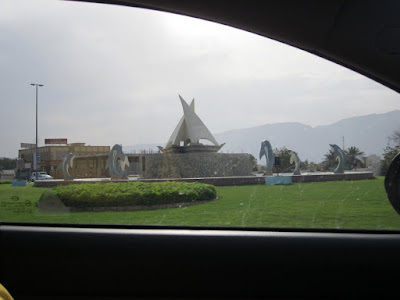 We were supposed to follow the road signs to "Golden Tulip Resort Dibba" as the camping ground was just next to it. 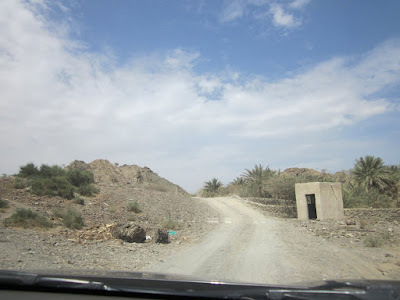 According to the Hotel Website it says, "once in Dibba, follow the road signs to the hotel". Only a couple of signs and quite misleading. 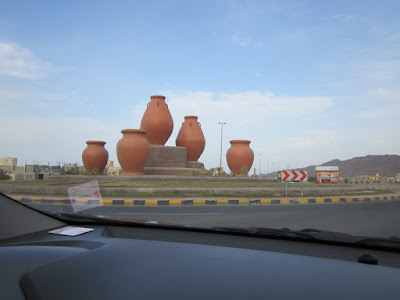 It was a comedy of errors as we mistook the Omani Border checkpoint as the entrance to the Port and circled around Dibba and the sorrounding hotels for almost 1½ hours. We did see a lot of the Dibba Town though. There was another huge camping site next to the Radison Blu Resort. We didn't want to camp there since the beach was full of construction material and there were no bathroom facilities. 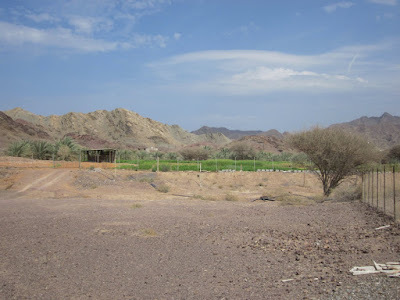 17:00 - Forgot about the road-signs and switched on Nokia Maps which finally took us through the Omani Border Checkpoint and almost close to the Hotel. 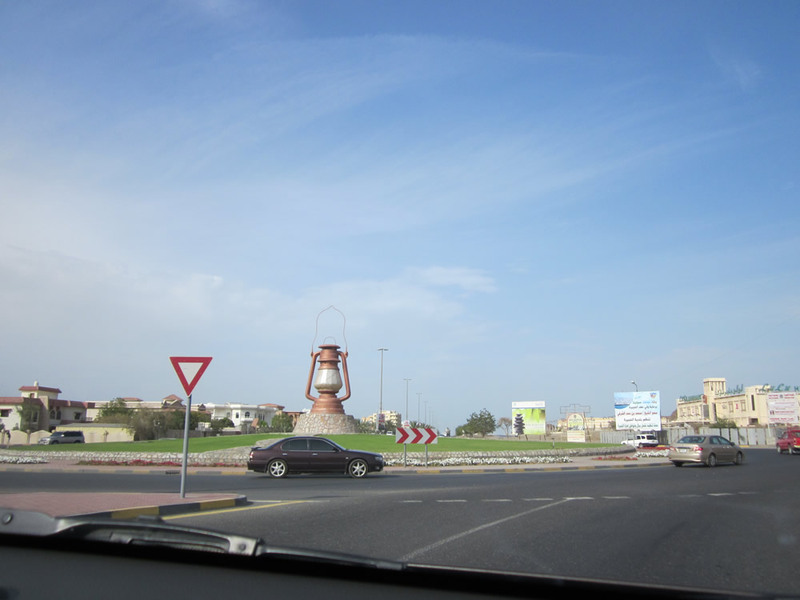 Interestingly, the Police on UAE side nearby were checking for people not wearing their seat-belts. No fines. Just advising the front passengers to strap themselves in. Found it highly interesting since you'd get fined in Dubai for the same offence. See map below for directions and don't forget to use the GPS coordinates of Latitude: N 25 40.319, Longitude: E 56 16.267 for the campsite. 18:00 - Remember your passports since they are checked at the border. No stamping of visa is required to enter this Omani enclave. The drive on the Omani side was quite peaceful as well. Nobody honking or flashing lights. It was a single carriageway, but nobody was trying to overtake each other though we found ourselves driving at 60KMPH behind slower vehicles on a 80KMPH road. Reached the camping site a little past 6 p.m. This camping site had almost-clean bathroom facilities. Note that the shower and most of the toilet hand-held bidets were broken. Also the electricity was not switched on (could be since we were there on a weekday). 19:00 - Found a spot next to the cliff wall and set up our tents. Used a second smaller tent to store all the knick-knacks. 20:00 - Started on the BBQ. Some Buttered Macaroni from Home made an ideal meal. Coals on Fire. Jordan and I enjoying milk from the car-cooler. Jordan busy with his spade and bucket. 21:00 - zzzz... The Happy Campers have gone to sleep. We were lulled to sleep by the sound of the ocean waves. The sound of the waves were coming from the side of the cliff as well as the beach that I thought that we were on a headland with the ocean on the other side of the cliff. But I was mistaken, and it seems the echos were playing tricks on me. The baby boy fast asleep. Suzie getting the tent ready for us to snooze. Great Blog. Thanks for the detailed and informative blog. 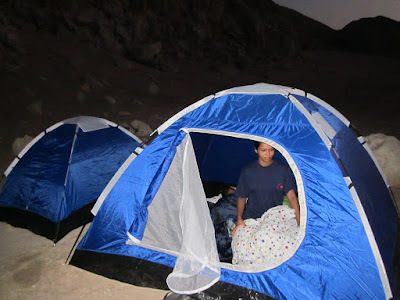 May I know whether Washrooms are usable at camp area and cab we use it to get fresh in morning after overnight camping?